By Babatis Banda: In self-comforting realization of the truth, the Pacfan base will sing this song for the next coming months until either Manny Pacquiao fights Juan Manuel Marquez again, or is bold enough to face the disputed P4P king Floyd Mayweather junior. 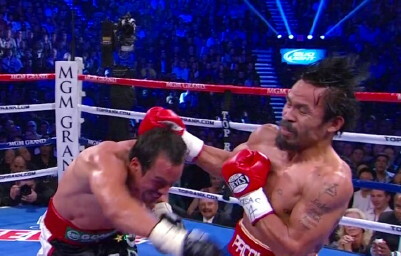 It is only comforting to the Pacquiao fans to find something to lay their sadness and shame on, after the poor performance by Pacman to yet another controversial win. This was supposed to be the decider, the equivalent of ‘Thriller in Manila’ but we saw a power puncher exposed by a boxer, with half the abilities of one Floyd Mayweather junior. The result was also a sharp contrast to the expectations of a bloodied Marquez, or a knocked down fighter as was the boasting before the fight. I am hopeful, that the two parties, Pacman and Floyd, will decide to put the row to rest once and for all. The boxing community should not entertain people who are working so hard to distract this bout from happening. Arum should not turn his personal financial gain by using Pacquiao as the money making machine and preventing the fight from happening, or his use his hate of Floyd from coming to sense with the talented boxer. Do you all realize that by delaying the action with Floyd, Arum stands to gain more millions of dollars? Without Arum, Pacman would have taken these tests long ago, and I am sure Pacman would have been retired, solidifying his political career as we speak. Fans will always talk for the sake of talk, promoters and all those concerned should ensure Manny fights Floyd without any further delay. Rumors and press releases should never take the place of negotiations between the two camps. We refuse the cheap act of turning to the press whenever there is a small development about the fight, we want level-headedness, make the negotiations a reality and we turn another page in the history of the sport. For those fans that live-off rumors or peddlers of rumors, reality lies in the two camps talking to each other and not spending time making Floyd looking bad. If you want your opponent to look bad, you have to look good yourself, otherwise you are just a hypocrite. It will matter less if Floyd think now he can fight Manny because he thinks he is on the down-hill, what matters is that we should have a fight happening, and it should the next for both fighters. « Is the Pacquiao gravy train coming to a squeaky halt?